I was recently reading a book review by Horatio Clare on the UK’s The Telegraph website about a recently published title, The Shepherd’s Life, by James Rebanks. I can’t say I really know a lot about sheep and shepherds. A few years back, I was traveling the Australian countryside to work with parishes and I know I saw more sheep than I ever imagined I would in an entire lifetime. However, I didn’t see many shepherds, at least not matching the image I have in my mind. Two things struck me when reading the article. The first was the statement, “Shepherding is not peaceful.” Psalm 23 has always seemed to me to be the peaceful psalm. Its reading consoles those who are troubled. It gives hope to people who are downtrodden. It eases the grief of those who have lost a loved one. The statement that shepherding is anything but peaceful gave me reason to pause. The writer went on to share about difficult weather, buzzards and crows attacking sheep, men screaming for order, and more. 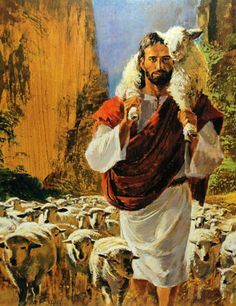 That is not what I think of when I see all those paintings of Jesus holding a snuggly little lamb on his shoulders and all the other snuggly little lambs as his feet seemingly wanting nothing other than hugs! The “clever, purposeful” ways in which men shear sheep, and the feeling of being “alive, necessary, needed” when the winter comes (Rebanks steps out into “that Brueghel painting of the snow and the crows”), the stress of haymaking and the fulfillment of a full barn, the sweet bounty of the meadows and their grasses, timothy, common bent, fescue and yellow rattle, all baled and stacked like the obedience to “a commandment from God”, are beautifully told. It struck me that in the face of a professional experience that is not peaceful, the shepherd receives a divine mandate to create that which is not there: peace. Then I got it! Psalm 23 gives almost a false sense of peace because that is what shepherds do. The paintings I have seen, and continue to hold in my mind, represent the point of view from the sheep. They do not see the critters that choose to attack them. They do not have enough intelligence to understand the disorder they create with their own natural movements. They are sheltered from the harshness of the weather by someone who leads them to safety. If the paintings reflected what really is happening, they would show chaos, fear, and danger, and then the shepherd whose job it is to protect them from those things. When my own three children were young, I had a responsibility to protect them from the realities of the world. When you are first awakening to the world you do not need to know about the wars, the poverty, the suffering, and the sin in this place. You need to know love, patience, and comfort. When my children placed their heads on their pillows at night, fear needed to be the last things on their mind, even though the world can be a scary place. Jesus calls himself the Good Shepherd in John 10 and he brings to us what cannot be truly found in this world: peace. Death could not even keep him from tending his flock. The risen Lord is alive so we can rest on his shoulders, so we can walk freely without being the prey of evil, and so we can have peace in the face of chaos. But there are still those in our world that know all too well the peril that surrounds them. They have not had a chance to enter into the world with a naiveté that allows little ones to know what safety feels like. They do not know the peace of a shepherd because they have never seen one. Consider the experience of those growing up on the streets of the US, those who hear explosions all day and night in parts of Africa, the Middle East, and even parts of Europe. Consider the orphan who has never had a real hug, or the children who saw their parents murdered before their very eyes. Consider the children in hospitals who suffer from terminal illness and experience short lives of constant pain. These are his lambs. They need Jesus. These are those who need real peace. And who will bring to them the Shepherd? Perhaps we should adopt a new moniker for ourselves in addition to the body of Christ: the body of the Shepherd. He is leading his flock this very day into places where weather, buzzards, and chaos threaten. If we have been with him for any real time, we know how peace feels. We can bring Jesus to these places. Consider the paintings of the Good Shepherd. Everyone deserves at some point to be the snuggly ones who just call out to be hugged.